These vintage-inspired planters use a passive hydroponic system that makes it easy to grow your own herbs. When chefs say fresh herbs make all the difference, they speak the truth. But where does that leave those of us with no garden, no time, and no green thumb? Harvest all that flavor with very little work with Sarah Burrows and Nick Behr's tinted, vintage-inspired jars. They're pure charm on the outside, but inside use a passive hydroponic system that brings nutrients up to the plants' roots while regulating moisture. There's no guesswork over whether the soil has the right amount of water. Plant the included seeds of your choice, put water in the reservoir, place the jar in a sunny window, and get growing. Assembled in the USA. Click here for Planting Instructions & Tips and Frequently Asked Questions. Designed for year round indoor use. Self-watering jar options include Organic Geneovese Basil, Organic Cilantro, Non-GMO Common Mint, Organic Greek Oregano, Organic Flat Leaf Parsley and Organic Sage. Included plant food does not expire. 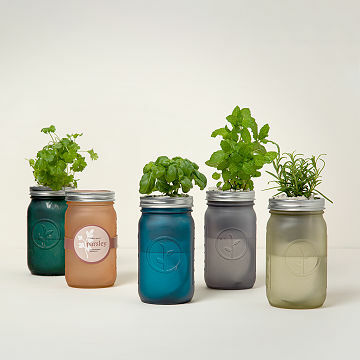 These herb mason jars are beautiful! Perfect gift for anyone who loves to cook, garden or enjoy simplicity! I bought three of the flower kits for myself as I love gardening but live in an apartment. The zinnias began to sprout within three days while the pansies and English daisies took almost a week. The zinnias already smell good and got their first water change with plant food today. Then I decided it was warm enough to start the herbs too. I have basil, mint, sage and parsley.The instructions are clear and the set up is very easy. My only issue is that the seed packet for the jar marked parsley was marked basil so I may have two jars of basil and no parsley. Overall, I love the product; the jars are pretty colours, they are very easy set up and care for, and the planting process and watching them grow provides a lot of enjoyment. The jars are on display in a sunny kitchen window and the light and colors are very pretty. The plants are practical, too. I got the basil and oregano. Basil sprouted right away and I was so excited. The oregano took awhile to get started and I thought it was a dud but then it started to sprout and caught up quickly. I don't usually cook with fresh herbs but I'm ready to go as soon as I find a good recipe to try. My aunt saw it at my house and she has already ordered hers. I bought this as a housewarming gift. The recipient was delighted to receive it and super excited to see it start growing. She said it was easy to put together. Great to do as a family and watch it grow!!! My kids and I loved putting this together and we are already seeing buds after only a week or two. we are so excited to watch it grow and then use it with our cooking!!! I can only comment about setup. It was easy to setup once I followed the instructions step by step. I'm really excited about growing the herb so I'll see what happens. It's cute. I've had it setup for about 4 days now. Nothing yet, as expected. It is very charming, practical and whimsical all at the same time. It's great for people who like to garden, cook with fresh herbs or decorate their home with pretty things. My boyfriend's mother thought it was such a sweet gift. It's perfect when you haven't known the person for too long!